The Logan County Area Chamber of Commerce would like to recognize Spend-A-Day Marina as June's Chamber Business/Entrepreneur of the Month. 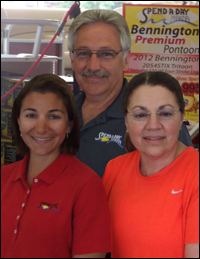 Their mission is to provide a distinctive customer experience while promoting an active boating lifestyle conducive to long term customer support. Spend-A-Day Marina started in 1950 by Bill and Marjorie Reed as a business offering boat rentals on Indian Lake. In the early years Bill took outside jobs in the off season to support keeping the first few employees. Since then they have grown to a business with 25 staff members including Jim, Roseann, and Monica Hurst partners in the business. Spend-A-Day offers full marine sales, service, dockage, boat rentals and a resort home community. They are in the process of renovating the resort home community to include a new swimming pool, which will allow them to be considered a complete resort community. When asked why they choose to be a member of the Logan County Area Chamber of Commerce they stated, "We recognize the value of being an active participant in the local community. The Chamber does an excellent job in promoting Logan County businesses to a wider customer base." Please join us in thanking Spend-A-Day Marina for their continued support for Logan County. Your generosity and support of community events county wide is very much appreciated.